So, because it passes so quickly, we want to instead be able to listen to the phases, the individual events in the waveform. 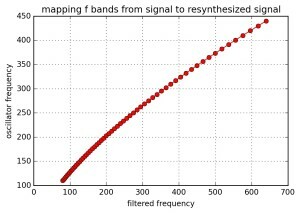 In this ”waveform resynthesis” method, we filter the signal many times with narrow band pass filters, then extract from each filtered signal its amplitude envelope, and then use each envelope to modulate the amplitude of a sine wave oscillator (a multiplication of the envelope with the oscillator. Then all of these oscillators (in the “oscillator bank”) are summed up to create a new signal that has characteristics of the initial signal, but many many more cycles so that individual phases are now sound events. We can hear individual phases by filling them up with summed waves of higher frequency, that we can stretch out as long as we want. Here are the frequencies at which we filter on the x-axis, and frequencies of the oscillators that will get modified on the y-axis. These are arbitrary aesthetic choices. The low beating pulses are, or should be, I think, the individual phases of the gravity waves. 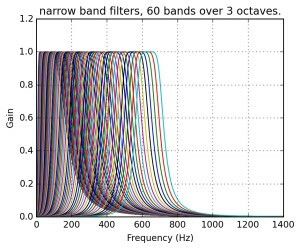 The higher frequency noise sloshes around incoherently between the stations, but the low frequency beats are coherent, increasing in frequency and amplitude. There is a lot of spurious information introduced, but in a sense that is what we are trying to do– so there is a lot of work remaining to control what information is introduced.